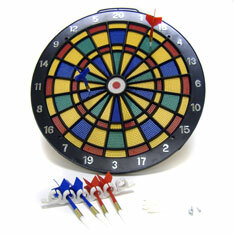 Large and safe dart board game. “Darts” are blunt plastic tips that burrow well into the pores of the board. Great gift idea! 14” diameter board. Sold and boxed individually. $4.25 each for 24 or more. $3.75 each for 48 or more.